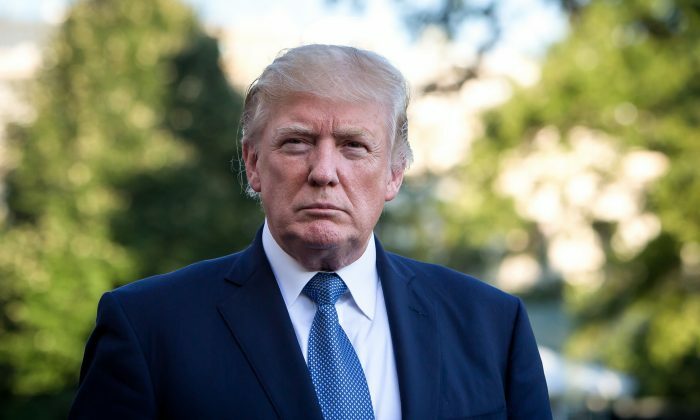 President Donald Trump told reporters on April 10 while discussing the origins of the investigations into his campaign that there had been an attempted coup. “This was an attempted coup, this was an attempted takedown of a president,” he said. 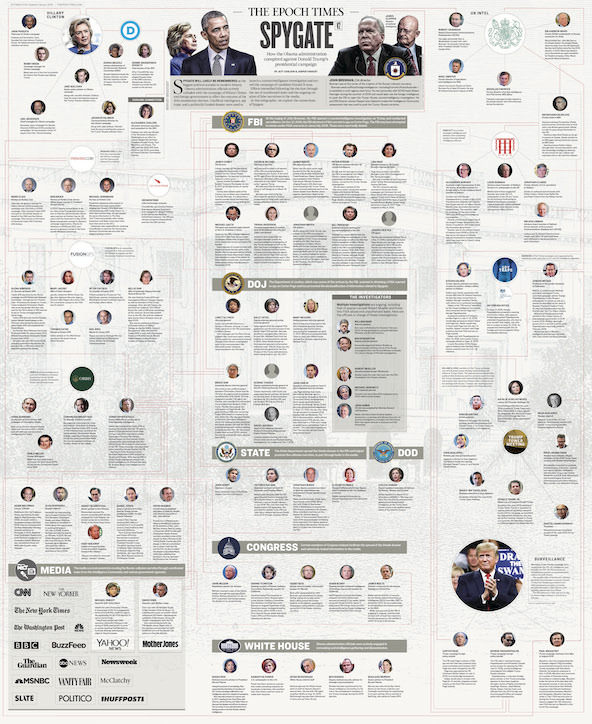 During the past two years, numerous details have emerged about how America’s intelligence and law-enforcement agencies were used against Trump during the 2016 elections. The scandal has become known as “Spygate” and refers to the creation of the Russia-collusion narrative, which was used in an attempt to prevent Trump from becoming president and subsequently to remove him from office. Specifically, during the 2016 elections, the FBI’s counterintelligence investigation into his campaign cast a shadow over it, and following Trump’s inauguration in January 2017, a whirlwind of false allegations that Trump colluded with Russia to win the elections were spread by media and politicians, leading to talk of impeachment. The so-called “Steele dossier” played a crucial role in the creation of this false narrative. It was Hillary Clinton’s campaign, as well as the Democratic National Committee (DNC), which had hired Fusion GPS—through their law firm Perkins Coie—to produce the dossier. Fusion GPS, in turn, hired former MI6 officer Christopher Steele and worked with former CIA contractor Nellie Ohr, wife of high-ranking DOJ official Bruce Ohr. Fusion GPS co-founder Glenn Simpson and Steele pushed this false information to the FBI through different channels, including the DOJ and State Department, as well as to reporters in U.S. media outlets, including The New York Times, The Washington Post, Yahoo News, and CNN. We also know, based on statements by then-House Intelligence Committee Chairman Devin Nunes (R-Calif.), that no official intelligence product existed to open the FBI’s counter-intelligence investigation into the Trump campaign. Former CIA Director John Brennan has publicly admitted that he passed intelligence on Americans obtained by the CIA—likely from foreign nations—to the FBI. “It served as the basis for the FBI investigation to determine whether such collusion [or] cooperation occurred,” Brennan said in a May 23, 2017, congressional testimony. Associates of Trump’s campaign, such as Carter Page and George Papadopoulos, were targeted by a series of unusual meetings involving intelligence assets. We also know that key FBI agents involved in the investigation were fiercely opposed to Trump. One such example is a text message one of the lead agents on the case, Peter Strzok, sent to Lisa Page, who at the time was special counsel to FBI Deputy Director Andrew McCabe, saying “we’ll stop” Trump from becoming president. And while Bill Priestap, then-director of the FBI’s counterintelligence division, was officially overseeing the investigation, McCabe would have frequent meetings himself, in his office, with agents involved in the case. It was this high-level involvement at the FBI that would help subvert the FISA process. Trisha Anderson, the former No. 2 lawyer at the FBI, testified to congressional investigators in August 2018 that she signed off on the FISA warrant application on former Trump campaign adviser Cater Page without reading it, due to the involvement of other high-ranking FBI officials. Her boss, then-FBI general counsel James Baker, would himself admit to congressional investigators how unconventional the investigation into the Trump campaign was. “I had a jaundiced eye about everything, yes. I had skepticism about all this stuff. I was concerned about all of this. This whole situation was horrible, and it was novel and we were trying to figure out what to do, and it was highly unusual,” Baker told lawmakers in August 2018. The spying continued well into Trump’s presidency as the FISA on Carter Page was renewed three times for 90-day periods. FISAs on other members of the campaign or transition team may have been issued. Other methods of spying on the Trump campaign involved the use of national security letters, which allow the FBI to subpoena customer records from banks, phone companies, internet service providers, and others, and the so-called practice of unmasking, which involved the un-redacting of the identities of members of the Trump campaign in intelligence reports. Notably, after Trump fired FBI Director James Comey on May 9, 2017, it was McCabe’s FBI that reached back out to Steele in an apparent attempt to re-invigorate or create new investigations into Trump. This came after the FBI had officially terminated its relationship with Steele due to his unauthorized contacts with reporters, as well as after his dossier had been publicly discredited following Buzzfeed News’ release of the document in January. And it appears that this is what Attorney General William Barr is doing. During two days of testimony on Capitol Hill, Barr told lawmakers that he believed there was spying on the Trump campaign and that he is looking into the conduct of officials who worked the Russia investigation. Jasper Fakkert is editor-in-chief of the U.S. editions of The Epoch Times.